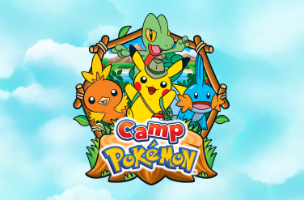 Just a few weeks after releasing Pokemon TCG Online on iPad, The Pokemon Company has released another new mobile app in the extremely popular universe of these lovable critters: Camp Pokemon. The entertainment app is categorized as being made for ages 6-8, and takes players to an island filled with Pokemon-themed activities. In Camp Pokemon, players complete mini-games as they learn what it means to be a Pokemon Trainer. Users first have access to the Pokemon Alternate Reality Exploration and Naming Area (or ARENA, for short), and can explore this location to learn more about spotting Pokemon in the wild. This mini-game sees users tapping and holding on the screen to bring up a spyglass, which highlights Pokemon and other objects hiding in the environment. When players think they’ve spotted the outline of a Pokemon, they hold on it to zoom in on the scene, and must keep track of the Pokemon as it moves. After players track the Pokemon for a few seconds, they earn its pin and catalog it. Players have a limited amount of time to earn as many pins as they can, up to six in total. Another game, Poke Ball Throw, sees users flicking Poke Balls at Pokemon cutouts that move across the screen. Each Pokemon must be hit with multiple Poke Balls before it’s captured and players earn its pin. Like with the ARENA game, players have a limited amount of time to capture up to six Pokemon. Other games focus on Pokemon evolutions, Pokemon battle advantages and identifying Pokemon based on their shadows. Some activities come with multiple locations or “stages,” which each relate to catching specific kinds of Pokemon (Grass or Water types, for instance). Players may need to play a game multiple times to unlock all of these stages. The more games players complete, the more pins or stickers they’ll ultimately collect, with pins filling an album in the camp’s office. Players can also track their high scores and earned medals for each event over time, and will unlock stickers that can be used to decorate photos taken with the iOS camera. It should be noted that not all activity types actually reward users with pins, but this is clearly marked before players begin a game. Camp Pokemon is available to download for free on the iTunes App Store. The game is currently featured as a Best New App on iTunes.